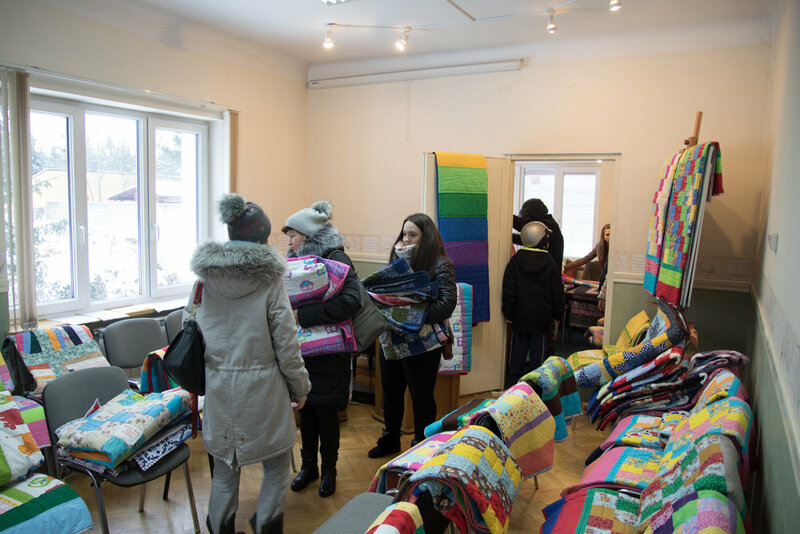 We held our give away on January 12 at our church building near Warsaw, Poland. It was a Saturday. I had notified people who had “liked” our charitable organization page and invited them, plus I had left coupons at the social services agency. I had gone back on Thursday, leaving 30 more coupons after leaving 90 coupons on Monday and they were all gone. Of course that didn’t mean that they would all get redeemed. In fact, I knew they wouldn’t. These are the coupons that people brought back in. I only have 49 that were returned! I went over to the building about 9 am on Saturday morning and I had 2 people waiting for me already. A man and a lady. They came in after I set up a table with some hats and small quilts on it and chose their quilts quickly. Then my son and daughter in law arrived right about 9:30 when we were due to start. 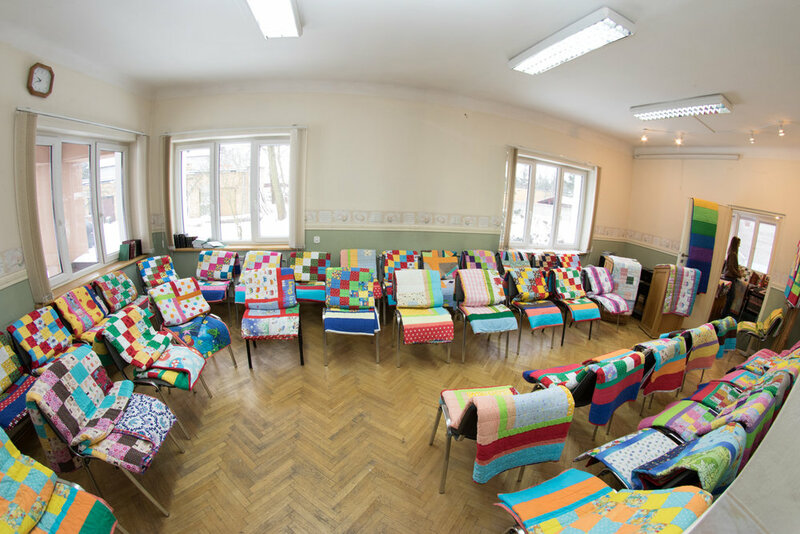 We already had the quilts laid out on the chairs and everything ready to go. People came in, handed me their coupons, walked through and chose their quilts. After they got their picture taken by my son, they left. I have to have the pictures in case we were ever asked by the government (either Poland or the USA) for tax reasons. Also, I assured people that all the ladies who help me need to see people who give me quilt tops to give away need to see it being given away. I do not actually know these people’s names for the most part. I know that they posed nicely for me to get pictures. We did all the pictures inside since we had snow outside. Brrr. 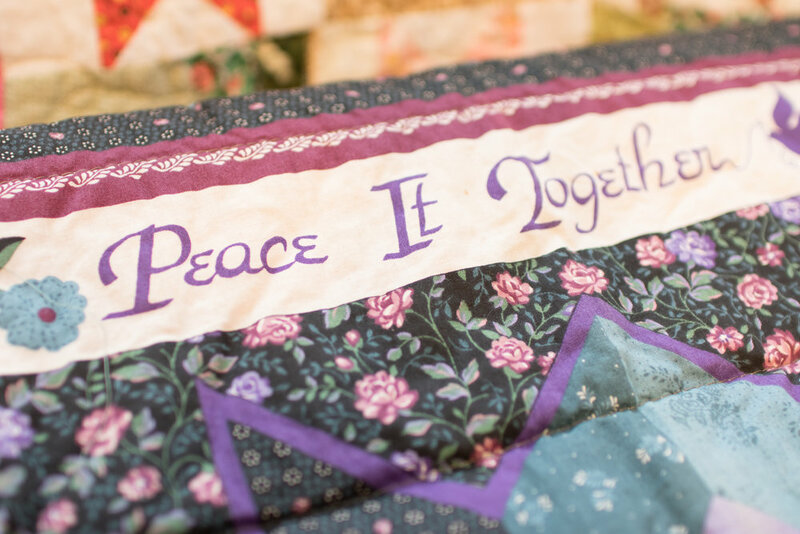 Once people had picked out their quilt/s, they went out the door. My son took their picture on their way out. We handed them an invitation to church and chatted with them if they wanted to, and they left. Some people went in and out quickly - almost as if they were afraid to be inside our building - maybe under 2 minutes. Others took their time and just wandered around and looked and looked. However, most made decisions rather quickly! We gave away 85 quilts. Obviously that means I gave quilts to people who didn’t have coupons as well as some who did, but not as many as they got. if I heard that they had more children than they had coupons, I invited them to take as many quilts as they needed. I knew by the turnout that I would have plenty leftover. I knew that the weather would hinder some and the grayness of the day. Just like when a company prints out coupons for things, even free things, only a certain number are redeemed, I knew it would be the same with me! in general, people mentioned how pretty they were - how colorful! That was pretty sweet! We did not give away as many as I wanted to, so I may do it again, but this time I will advertise only children’s quilts. I have 68 regular quilts left plus 1 rag quilt. Of the 68, only 18 are what I would quilts for adults. All the rest have children’s themes. I would like to whittle that number down. Way down. So, while I made those coupons before, I will rework it just a tad bit and put on it that there are only children’s quilts left. I want to save those men’s ones I have left for next time. My sis and I had made a LOT of men’s ones. This is the first one to go! This man was very nice. Friendly. And pretty quick to decide. After the first two people came I made this short little video - very short - showing some more pics. I talk during it unlike the last one. I’ve got to get better with video! I’m learning to quit trying to figure out what the men will take, though. I’ve seen men take pink ones and/or crazy things - ones I’m sure that women will go for. As the morning went by, as quilts were taken off the chairs, we replaced them until the morning was gone. There wasn’t much variety here in the quilts I had laid out. Sadly, however, I am almost out of what I call the pretty ones - the ones I know that the ladies will like. 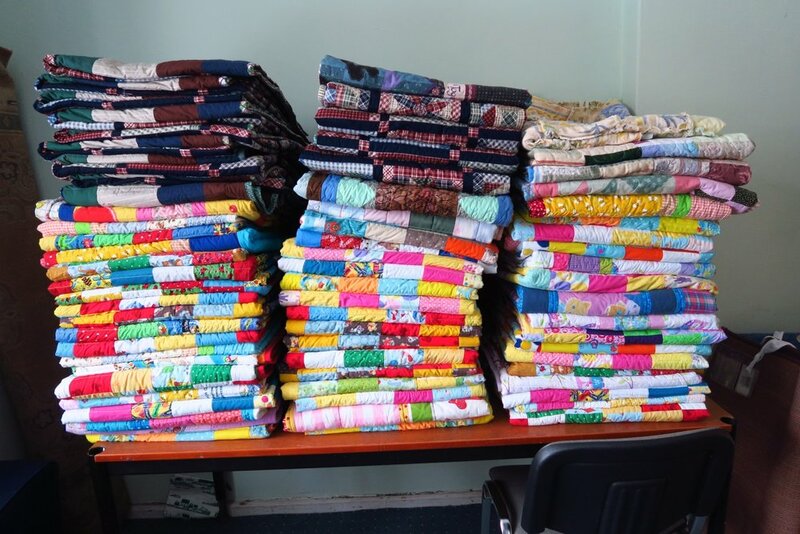 The last almost 70 quilts I still have! All but 18 are children’s quilts. Also, I am out of things for young adults and teens. I need to make some more with solids. I am sort of chomping at the bit to make some more tops for this group. These are the leftover quilts! I am going to try to give more of them away before I put them back in storage. 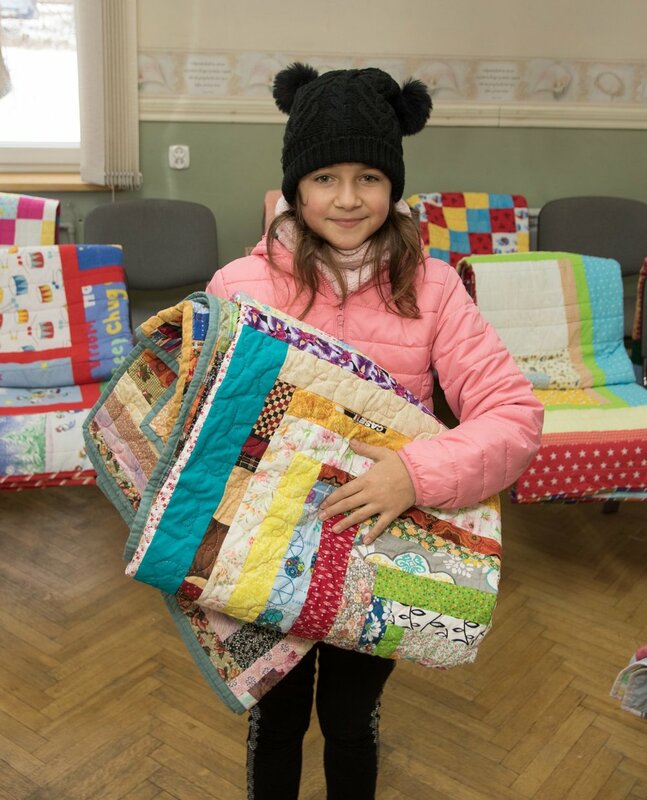 If’d like to give away most of the children’s quilts. I don’t mind keeping the adult quilts as they aren’t quite as easy to come up with the dark, fully saturated colors that they seem to love here as it is for a children’s print! And now you know! This is what we’ve had going on here lately!